An image has bee posted on USENET of Google’s first server bil. The bill, dated September 28, 1998 includes all the setup and maintenance fees Google paid to get online. 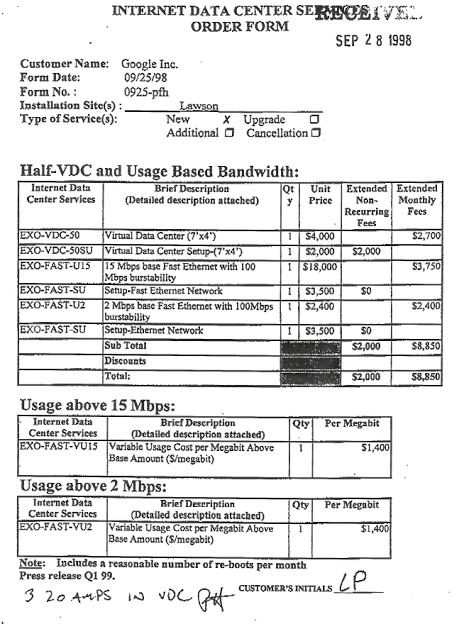 The invoice lists two network connections, one 15Mbps connection with 100Mbps burst capacity, and another 2Mbps with 100Mbps burst. The faster of the two cost $18,000 per month back then, but Google’s prorated charge was a mere $3750. Even then, Google was gobbling up bandwidth. The basic connections weren’t enough, so the company bought two additional megabits at $1400 each, just to be safe. Google’s 7×4 foot server cage was running 30 PCs at the time, most of which housed the database. However, four were dedicated to crawling the web. Larry Page convinced the datacenter to give Google a break on the cost of the crawler bandwidth since it was all incoming traffic and didn’t cost much for Exodus. You can also see where the datacenter noted on the form Google was using “3 20 Amps in DC” in that little cage. Note the “LP” at the bottom — that’s Larry Page. Shortly after Hölzle came to Google, the company expanded into a cage next to the original one that was three times larger. This is where the first rack servers went up. We don’t know how expensive that one was, but if an extra megabit was $1400, it was probably a lot. The next major Windows release is likely to be called Windows 9 and will be launched in April 2015 according to posts on Microsft related USENET newsgroups. The website reports that Microsoft will shed more light on Windows 9, currently codenamed “Threshold”, at its BUILD conference in April. Microsoft is also set to introduce the ability for Metro apps to run in a window on the desktop and a tweaked start menu, the website claims. Although, as many point out on newsgroups, Metro was the least liked feature of Windows 8. However, before Windows 9 is out of the door, Microsoft will issue Windows 8.1 Update 1, a comparatively minor update that is set for release later this year. Windows 8 saw a mixed reception upon its release in 2012. On the one hand, it was praised for its speed and reduced system requirements but it was also criticised for omitting the start button and introducing a new touch-enabled UI. How Windows 9 will pan out and how easy it will be to install and use newsreaders and the like to access USENET is still be to be seen. In order to squeeze the ultra-fast 10Gbps USB 3.1 standard into the next gen of slim devices, the USB 3.0 Promoter group has just announced the USB Type-C connector. It’ll be similar in size to existing USB 2.0 Micro-B connectors, while bringing USB 3.1 speeds and other distinct advantages over current cables. For starters, the new design will be reversible like Apple’s Lightning ports, meaning at long last you won’t have to worry about which end goes up. In addition, Type-C will bring scalable power charging and the ability to support future USB standards. The downside is that it won’t be compatible with existing connectors, but if we don’t have to do the flippy dance to insert a phone cable anymore, we’ll take that trade-off in a New York minute. Think your 802.11ac router is pretty amazing? It’s got nothing on a new system created by the Franhofer Institute and Karlsruhe Institute of Technology in Germany, which recently completed a 100Gbps data transmission. That’s roughly fourteen times faster than the most robust 802.11ac equipment can manage. But there is a catch. The research team’s success came in a laboratory environment and took place over a distance of just 20 meters with no obstructions. That doesn’t make the fact that the team sent and received the equivalent of a full Blu-ray disc of data in two seconds any less impressive, of course. It’s amazing to think that what Fraunhofer and KIT have done here will vastly improve rural Internet access — and even dramatically speed up our in-home Wi-Fi networks in the near future. The reality will be much different, though. For starters, the design is better suited as a replacement for commercial WANs — specifically remote office links that use microwave transmitters today. The 237.5GHz signal wouldn’t be great at penetrating walls, but it’s well-suited to line-of-site networking. Beyond that, proof-of-concept setups like this one never make it to market in their pure forms. Trade-offs have to be made in order to get the tech out there, and incumbent ISPs are rarely eager to spend money on new technology without making absolutely sure they’ve squeezed every last dime out of the old first. Just look at how long it took for DSL to go from the lab to the Average Joe’s residence. A recent upgrade to the Thundernews servers has now allowed us to offer all of our customers a tremendous increase in retention to over 1830 days for all binary USENET newsgroups. The increase in retention is yet another featured upgrade to the many that have been recently announced by Thundernews.com. The increase in binary retention to 1830+ days will allow users to access articles that had been posted to newsgroups well over 5 years ago! The binary retention upgrade to 1830 days is automatically available to all members and comes at no additional costs. Thundernews.com is proud to be able to offer its customers this upgrade and will continue to provide the same level of premium Usenet newsgroup access that is come to be expected as a leading Usenet access provider. Worldwide Internet traffic reportedly plunged by about 40 percent Friday night, when many of the tech titan’s services, including its trademark search engine, went dark for between 1 and 5 minutes, according to USENET newsgroup reports. The outage, which reportedly affected not only Google Search, but also Gmail, YouTube and Google Drive, occurred between 7:52 p.m. and 7:57 p.m. ET on Friday. The company would not comment on the lapse’s cause, other than to direct media outlets to a brief message posted to Google Apps Dashboard that essentially acknowledged the situation. Usenet newsgroups had little to shed light on the cause at the time. Fortunately, everything seemed to come back online minutes later. But exactly how an operation like Google’s can even go dark like that, all at once, is anybody’s guess. It is unclear how much revenue was lost by the short-lived but intense outage, though some experts are putting it in the hundreds of thousands of dollars. This isn’t the first time Google has gone dark. The services went down in May 2009 and was later blamed on a massive server failure. Throughout this time, ThunderNews USENET service experienced no outtages. In fact, a small surge of posts occurred during that time. You can get faster USENET speeds with your Venti as Google is giving WiFi systems inside Starbucks stores a big shot of network caffeine by bringing in new high-speed service, which promises to be 10 times faster than the existing AT&T systems it will replace. AT&T had provided Wi-Fi at Starbucks stores since 2008, but Google beat out the telecom giant when their contract expired. AT&T also proposed a faster Wi-Fi proposal to Starbucks but lost out to Google. The move toward faster Wi-Fi comes as mobile and PC users increasingly require faster connection speeds to do things like stream video, download large files and browse USENET newsgroups. Starbucks’ free Wi-Fi has long been popular among online users, with millions accessing the service each week. The faster connection speed is likely to attract even more visitors, particularly as carriers move away from offering unlimited data plans for mobile devices. Google has several projects nationwide aimed at making internet speeds faster, which translate into more searches, and therefore bigger advertising dollars. How much storage does a USENET newsgroup subscriber need? If you’re answer is in the range of 300GB, you’re in luck! First there was the CD, which held 700 megabytes. Then the DVD, which held 5 gigabytes. Then the Blu-ray disc, with 50 gigs. What’s next? Sony and Panasonic hope it will be a 300-gigabyte disc they’re jointly researching that could hit in 2015. The new discs will be tough, like most disc-based storage currently available, being not only water- and dust-proof to an extent, but also able to resist changes in temperature and humidty when stored for long periods of time. Flash storage and hard disk drives don’t have the same sort of long-term reliability you can expect from an optical disc, which is why developing a 300 GB disc still remains important for some industries. The two companies were among those that created the Blu-ray Disc format. The companies pointed to the growing need for archiving, from video production industries that store motion pictures and broadcasting, to cloud data centers. Sony and Panasonic touted their existing breakthroughs in optical drives, including Sony’s file-based optical disc archive system from 2012 and Panasonic’s series of optical disc storage devices, which houses 12 100GB discs for a total storage capacity of 180TB. Both have also contributed to the development of Blu-ray format technologies. The world’s biggest cell-phone maker, Samsung, caused a stir last week by announcing an ultrafast wireless technology that it unofficially dubbed “5G.” And the technology has, in fact, been tested on the streets of New York. The system is impressive but is still in development—which is true of all the technologies that will underpin the next generation of wireless communications. When 5G does arrive, it will likely combine new wireless protocols with new network designs, spectrum-sharing schemes, and more small transmitters. Samsung says its new transceiver can send and receive data at speeds of more than a gigabit per second over up to two kilometers—and it could deliver tens of gigabits per second at shorter distances. This compares to about 75 megabits per second for the latest standard, known as 4G LTE. The Samsung technology relies on 28-gigahertz frequencies, which can carry commensurately more data but can be blocked by buildings, people, foliage, and even rainfall. Samsung says it has greatly mitigated these problems by sending data over any of 64 antennas, dynamically shaping how the signal is divided up, and even controlling the direction in which it is sent, making changes in tens of nanoseconds in response to changing conditions (among other features, it can catch stray reflections of signals that had bounced off an obstruction). The company did not grant an interview request, but the technology is described in this 2010 patent filing. The everyday reality for consumers is that in many cases, high-speed data is better when it’s coming from Wi-Fi hot spots, not 3G and 4G networks, whose peak speeds are not always available everywhere or at all times of the day. This begs the question: Are faster cellular data speeds really what we need, or would we be better served if 5G improved what cellular standards do better than Wi-Fi, which is wide area mobility and seamless connectivity? Despite the high data speeds on 3G and 4G networks, we all still suffer from dropped calls and poor coverage in many places. One technology that could provide better coverage by hopping between different frequencies and different wireless protocols is known as cognitive radio. On a second-by-second basis, such a radio would detect and exploit available spectrum holes. In the mid term, this is a more likely solution for high data rates and mobility than using higher frequencies. While Samsung’s technology may form part of the 5G future—an ultrafast network technology running in hot spots—a larger mix of technologies and strategies will be needed to deliver data more quickly and reliably. Standards are set by the International Telecommunications Union, a United Nations body. It will be several years until even all of the 4G LTE versions are rolled out. Samsung said its technology could be ready by 2020.